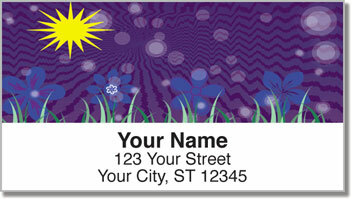 Charming blue blossoms are set against multi-colored skies on this vibrant set of return address labels from CheckAdvantage. Usually, having the blues is a bit of a bummer. But these adorable labels are sure to make you smile! 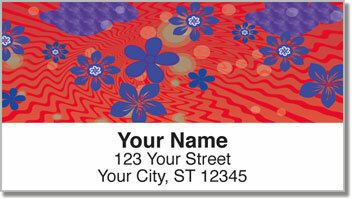 The design has a groovy psychedelic feel letting you forget about everyday doldrums for just a moment. Use Cute Blue Flower Address Labels to give your boring brown packages and dull white envelopes a blast of color and personality. 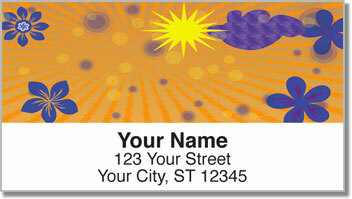 Plus, you'll save tons of time by eliminating the need to write your name and address over and over again. Just stick these self-adhesive labels on all your letters and packages. 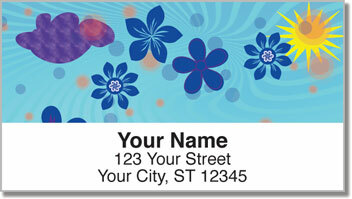 Order Cute Blue Flower Address Labels today! You can even get them with matching personal checks.